On 6th February, Gerhardt Friedrich Thode - a businessman from Dresden - teamed up with Wilhelm Eduard Michael, an apothecary from Chemnitz, to found the "Thode & Michael Papierfabrik in Hainsberg" (Thode & Michael Paper Factory in Hainsberg) by the Weißeritz river in Hainsberg. 60 employees supplied 77,000 kg of "finest paper". Thode´s sons Friedrich Edmund and Robert Wilhelm take over the practical and business management of the factory. the owners sell the company to the General German Credit Institute in Leipzig, who launch the business as the "Thode´sche Papierfabrik zu Hainsberg” (Hainsberg Thodian Paper Factory) joint stock corporation on 1st July. 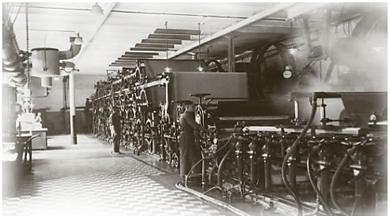 a third paper machine is set up, a Donkin paper machine with an 82 inch wire width. for the manufacture of tissue paper. one of the first Saxony gasworks is built in Hainsberg, with 3 furnaces and 8 retorts. the "Rabenauer Mühle" wood mill is adjoined to the factory. the factory-own manufacture of raw materials is supplemented by the construction of the first German straw pulp factory. the fifth paper machine is put into operation. the straw pulp factory and the newsprint machine - built in 1890 -were shut down. a new bleachery is built. paper machines nos. 1 + 2 are converted to produce spinning paper, which is then spun into wood fibre and cellulose yarn. a new boiler house with a 75m high chimney and an electric power centre is built for the factory. the Füllner company construct in a new building a new, high-speed, 265cm wide paper machine including a complete edge mill and beater room. a 750 HP back pressure steam turbine is put into operation. the Köttewitz paper & card factory, which has two paper machines, is affiliated to Hainsberg. the Gröba paper factory near Riesa is affiliated. production in Hainsberg is stopped on 6th May, but recommences shortly afterwards on 15th May with a single paper machine. The first paper is taken by a group of Soviet officers to organise the print of the “Täglichen Rundschau” (Daily Panorama) in Dresden; on 9th June, the factory is put under Soviet administration, though the “Thode´sche Papierfabrik Hainsberg” company and the joint stock corporation continue to exist; the “Tägliche Rundschau” acts as principal stockholder, holding 67% of the shares. the joint stock corporation is dissolved, and the paper factory is taken over on 1th October by the Zentrag (Central Association of Printing, Purchasing and Auditing). Carl Vogel, director of works, and Kurt Kliem, director of business - both of whom had been in charge of the factory since 1945 - are dismissed at the end of September. PM 4 - built in 1923 - is converted. a new power plant is put into operation. a bill blade coater is added to PM 4.
waste paper is utilised for the first time in Hainsberg - due to a ‘lack of raw materials’. the Nossen Paper Factory and the Technitz Paper Factory are affiliated to Hainsberg, bringing in a further 3 paper machines. a new paper machine - the current PM 5 - is put into continuous operation; paper machines 1 and 3 are closed down. after the GDR’s Volkskammer (People’s Parliament) officially decide to integrate the former East German states into the Federal Republic of Germany, the Papierfabrik Hainsberg GmbH is founded on 1st July; the newly founded Dresden Papier AG (Dresden Paper Group) acts as sole shareholder. the company begins to concentrate strategically on manufacturing graphic recycled paper. the waste paper treatment plant - including a Deinking flotation plant and bleaching plant - is completed; PM 4 is closed down. Dresden Paper Group sells the factory to the Golzern Holding GmbH. the company invests nearly 7 million Euros in the conversion of the paper machines and a wastewater treatment plant. the Weißeritz river bursts its banks, flooding the factory and the whole town of Freital immensely. Step by step, production recommences from 9th October on. a new roll cutting machine and a new starch preparation plant are put into operation; a hood with heat recovery system is added to PM 5.
a cut-sizer is set up and put into operation for copy paper. Hoya Papier GmbH takes over the Papierfabrik Hainsberg GmbH as majority shareholder; shortly before the close of the year, a new warehouse is opened for stock. a new power plant, run on pulverised lignite, supplies the factory with all the steam and some of the electricity it needs.